The AF-1000 replaces all current Florence and Auth 3, 4, 5 and Auth 6 wire amplifiers. It utilizes the TR-1 Transformer for 16 VAC power. 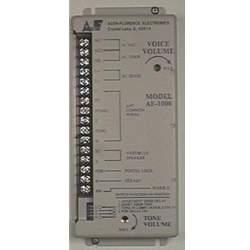 The AF-1000 provides amplification, outside door to apartment signaling and vestibule door release control. · Tone and Voice Volume Controls. · Steady or Warble Call Tones. · AC and DC Door Entrance Options. · Attractive Light Grey Case.